Pride in London is the city’s biggest one-day event, and one of the world’s biggest LGBT+ celebrations. 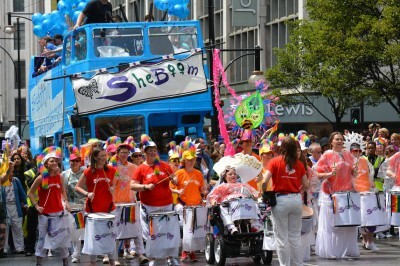 Last year more than 750,000 people came to Pride in London, and 30,000 people joined the Parade. Pride in London takes place from 21-28 June 2015, with the main Pride events taking place on Saturday 27 June. The Pride Arts Festival runs from Sunday 21 to Sunday 28 June and showcases London’s varied LGBT+ cultural scene. Three stages: Pride in Trafalgar Square, the Women’s Stage and Cabaret Stage in Soho. The main event is the Pride in London Parade which runs from Baker Street to Whitehall, via Oxford Street, Piccadilly Circus and Trafalgar Square, and begins at 1300 on Saturday 27 June. The Parade theme is Pride Heroes. Parade Route The Parade assembles on Baker Street (individuals cannot join the Parade unless they are in a registered group) and leaves at 1300. It turns left into Oxford Street, past Selfridges, Bond Street Underground Station, and John Lewis. At Oxford Circus it turns right into Regent Street and continues down to Piccadilly Circus. From there it heads down Lower Regent Street and into Waterloo Place, then left into Pall Mall, heading right into Cockspur Street and across the south-western end of Trafalgar Square. It turns into Whitehall, before dispersing (ending) in Whitehall Place. The end of the Parade is expected to reach the dispersal point at approximately 1630. Tags: LGBT+ celebrations, London’s varied LGBT+ cultural scene., Pride Arts Festival, Pride in London - 21st to 28th June 2015, Pride in London 2015, Pride in London Parade, Pride in the Park, Pride in Trafalgar Square, the Women’s Stage and Cabaret Stage in Soho.